Scrap metal dealer Stephen Wayne Slark, 41, of Butts Road, Southwick, was jailed following his 43rd conviction in Sussex. 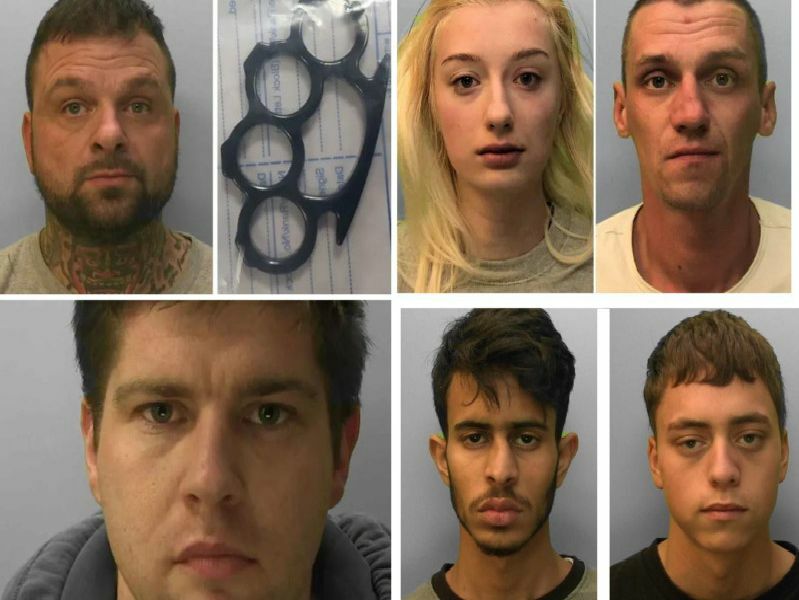 Slark (pictured with a knuckle duster found in his possession) was sentenced to three years imprisonment (and had another year's sentence activated) after pleading guilty to aggravated burglary, driving while disqualified, theft and assault. Drivers Bryn Coughlan (pictured), 24, and Christopher Keating, 29, were jailed after a teenaged passenger was tragically killed in a crash after a high speed race near Horsham. Coughlan, of Daux Avenue, Billingshurst, was sentenced to four years in prison for causing death by dangerous driving. Keating of Eastcroft Mews, Horsham, was given three months in prison for dangerous driving. Aaron Lucas, 23, was jailed for robbery and intimidation after attacking a man in broad daylight on his way home from Lancing Railway Station. Lucas was jailed for five years and will spend four years on extended license upon his release. Edward Butler, 44, was spotted by officers driving dangerously along Sheepwash Lane, Lavant, but when officers stopped him they found him in possession of stolen Christmas presents. Butler, of Tangley Walk, Havant, was jailed for a year and given a two-year driving ban.